Painting photographs with encaustic opens up another whole world of possibilities! Photographers can take their art to a new level adding more interest and texture to their pictures. I’ve read about photo encaustic and I understood the process, but I hadn’t tried it before. This past weekend I had the opportunity to try my hand at photo encaustic at a workshop with Tania Willems. The photo encaustic process involves printing photographs on paper and adhering the paper to a substrate creating a paper ground. The artist will then paint with encaustic on top of the photo. Before you begin painting photographs, you can enhance the image with photoshop or a photo editing app before you print them. You may wish to add a photo filter to give the image a more painterly quality. Tania showed us some fun apps on her iPad. Choose paper that is heavy, matte, non-glossy and absorbent. Tania recommended 80lb paper. You can use your computer printer or have it printed at a print shop. The image needs to be a bit larger than the panel. Positionable Mounting Adhesive by 3M will allow you to position your photo exactly where you want it on the panel and best of all, you won’t have to wait for the adhesive to dry! When you’re happy with your positioning, place a cover sheet over the image and thoroughly burnish the photo to set the adhesive in place. It is available in 50-foot rolls and a variety of widths. If you have acrylic gel medium you can use that instead. Some artists swear by YES! paste but I understand that it isn’t considered archival in humid conditions. If you’re using acrylic gel medium, you’ll need to use a brayer to smooth out any air bubbles and you will need to put the panel under some heavy books and leave it for at least 12 hours until it is completely dry. Now, turn the panel face down on a clean cutting board and with an Exacto knife trim the photo to the size of the panel and use a piece of sandpaper to smooth the edges. Think about how you want to finish the edges of your panel before you start to paint. Painter’s tape will protect the edges from drips of wax so they will be clean when you are ready to finish them. Brush on medium. Using a natural bristle brush, apply 2-3 layers of encaustic medium. Fuse. Use a gentle embossing heat gun in conjunction with an iron to fuse each layer. A blow torch or powerful heat gun isn’t advisable. You don’t want to fuse too much. The heat will make the wax cloudy, stop and let it cool down—more heat is not going to make it less cloudy. Scrape. Now use a razor blade or pottery tool to gently scrape off a thin layer of medium and pull up areas of the image that you want to bring into focus. Be careful not to scrape down too far. You can use a variety of encaustic techniques and drawing products on top of the wax to enhance your photo. Pan Pastels are the first thing that comes to mind. They are ideal for photo encaustic! Water Soluble Wax Pastels are also terrific here. Caran d’ache Neocolors can be used wet or dry for watercolour effects. Reeves Water Soluble Wax Pastels are less expensive and they work very well too. Try using Neocolors wet and Reeves dry. Gently fuse the wax pastel with an embossing heat gun. Finish the edges of your panel. I usually paint the edges with a black acrylic paint and put it in a nice floater frame. You can buff your painting to reduce any cloudiness and make it shine. You’ll need to wait until the wax has cooled and cured. Don’t do this when it is still warm or just newly completed. Use a warm hand, a clean and lint-free cloth or a nylon stocking. I had read about this process and was itching to try it. The encaustic workshop with Tania Willems was a great way to start painting on photographs with encaustic. The studio was well equipped with a wide range of supplies we might want to try. The big learning for me was about fusing. When the wax was hot it was beautiful but as it started to cool it became cloudy. If I had been on my own I would have continued to fuse. Tania stopped me and told me that the heat was causing the wax to become cloudy and that I needed to scrape off the top layer of wax with a razor blade. I would love to hear from you. 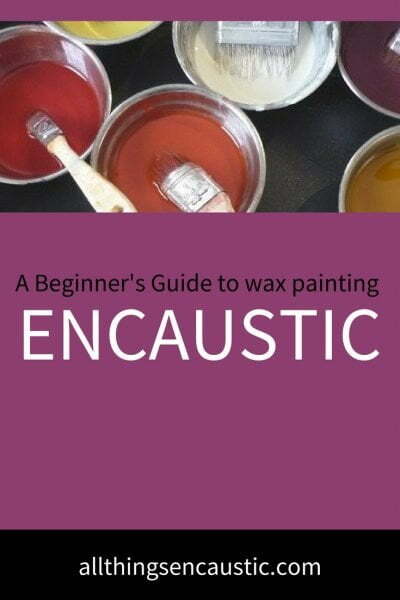 Please add a comment below about your experience with photo encaustic. Hello. I am enjoying the blog and information it contains. Very informative. One question: What ipad photo apps does Tania recommend for creatively altering original photos to give them a painterly look? Hi Linda, Repix and Waterlogue are 2 that she recommended. Does anyone know how to give an “encaustic look” to a photograph DIGITALLY?? Why? The zen of creating the work is a huge part of what makes the piece satisfying. Attempting to recreate the “look” of an encaustic would be cheating yourself of the pleasure of creating a work of art. Hi. I am a complete newbie to this and am going to apply wax over Gum Bichromate prints. You mention using pan pastels as ideal, which I have a selection of. How do I apply the pastel powder – to the image first and then add wax or mix the pan pastel powder separately with wax before applying? Thanks for your site, it has an amazing amount of information which I intend to work through, but I am itching to get started. Thanks. Hi Alan, I’m not familiar with Gum Bichromate prints but here is how to apply pan pastels over encaustic medium. First, lay down layers of encaustic medium and fuse the wax. Then apply the wax with the sponge applicators to warm wax. You can then burnish the pastel into the wax with a gloved finger. The warmth of the wax and the friction created by burnishing will help the pan pastel and wax bond. You can fuse pan pastels gently with a heat gun on low or a blow torch but fusing will change the pastel. Hi Ruth, thank you so much for explaining the process of applying the pan pastels. I am really excited about the possibilities of adding wax and paint to my work, but naturally the first attempt is feeling daunting…I just want it to be perfect first off I guess. Thanks again, this will help me take the leap!